Having worked closely with teens in public libraries for thirteen years, I have discovered they are among the most creative of age groups. Who else would think of a Harry Potter character jumping out of library shelves for a promotional video, or representing themselves and their friends with anime drawings? Teens are always full of surprises, just waiting for a chance to be expressed. Libraries have growing numbers of culturally diverse teens involved each year and that adds more fun to my job, but library programs aren’t always keeping up with change. Youth programs should help build teamwork and confidence, and teens should be encouraged to speak their minds and find their voices. Podcasting can encourage youth to speak about their diverse cultures and viewpoints, foster self-confidence, and develop new technology skills they can use for life. Teaching teens how to podcast is a great way to empower your teens and give them a platform to voice their opinions and unique experiences. The first step toward great podcasting is to prepare a room with the necessary tools, the appropriate seating space, and a relaxed ambience. I know from experience that teens will open up and speak their minds only with someone they are comfortable with and in a place where they feel safe and relaxed. I chose the Discover Studio, a makerspace lab where we teach technology programs at the Boca Raton Public Library. The Discover Studio is a private space with nine Mac computers and GarageBand preinstalled on each. My goal is to design this as a program—not a formal class—and I envision this as a gathering place for the teens to hang out and tinker with their creative projects. In this studio, we also have high-quality microphones that the teens can share. Audacity will do the job if your lab has Windows computers, but GarageBand is my preference since it is intuitive and has many built-in features and effects. It also comes with a variety of sound clips ready to use. My podcasting programs offer three sessions, each scheduled once per month. Most of the teens participating in podcasting are our regulars—some of them already know each other from joining in other teen programs and book clubs. For easy recording, I divide them into groups of four or five. Each group member should choose a “role” in the first production. They can be a host, co-host, guest, music manager, or podcast editor. It can take the shape of popular formats such as a standard podcast, a forum, or a radio talk show. Setting up a timer is an effective way to keep track of time and make sure that no one dominates the discussion. In a rewarding session everyone has a chance to contribute, and it’s your job to facilitate that outcome! The podcast can start with introducing themselves and the topic (or name of the podcast) to the audience, unless the teens come up with a more creative beginning. Now that you and your teens are involved in the podcasting, it’s time to focus on content. Ideally this is a forum where all teens have a chance to share their unique cultures and backgrounds as well as their individual thoughts and experiences. In one of my sessions, the teens enjoyed talking about food in their respective cultures. The host asked each guest to take turns talking about delicacies. I was surprised to learn so many new dishes from what they shared in a one-hour program: Poulet Aux Noix or chicken and cashew nuts is a Haitian dish. Popular in middle-eastern countries like Greece and Turkey, Baklava is a rich sweet dessert filled with chopped nuts and syrup or honey. A student from Thailand mentioned Thom Kha Gai, a chicken coconut soup. It’s helpful to let the teens unwind and talk freely first to get the creativity flowing, and wait to edit the piece afterward. Don’t worry so much about music and effects that might distract from the main content. If necessary, you can help them insert music later. Somewhere along the line, you’ll need to cover the basics of using the app of your choice, and all podcast sessions should include a quick lesson on copyright, creative common license, and public domain. During our session, a spirited discussion about manga and anime followed the food talk. The teens talked about their favorite manga or anime and recommended the series to their friends. K-pop music and Korean drama is another engaging topic for teens. 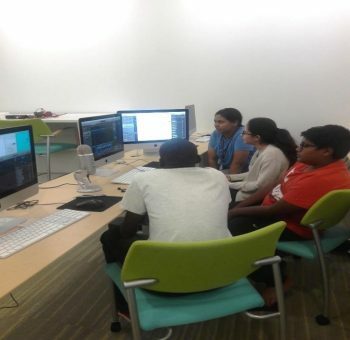 In creating a podcast, teens learn how to produce content that fits with their interests and displays their unique talents. They can read poetry they write, perform impersonations, retell stories, or share rap music—whatever fits their own style. I see podcasting as one of our greatest tools to build self confidence in teens. Since podcasts revolve around topics that teens are passionate about, they tend to talk more freely, showcasing their skills, interests, and talents. Finally, they have the experience of someone listening to their point of view and caring enough to ask what they think about an issue. This is a forum where their opinions count (including a diversity of individual opinions and cultural differences) and their creativity can shine. 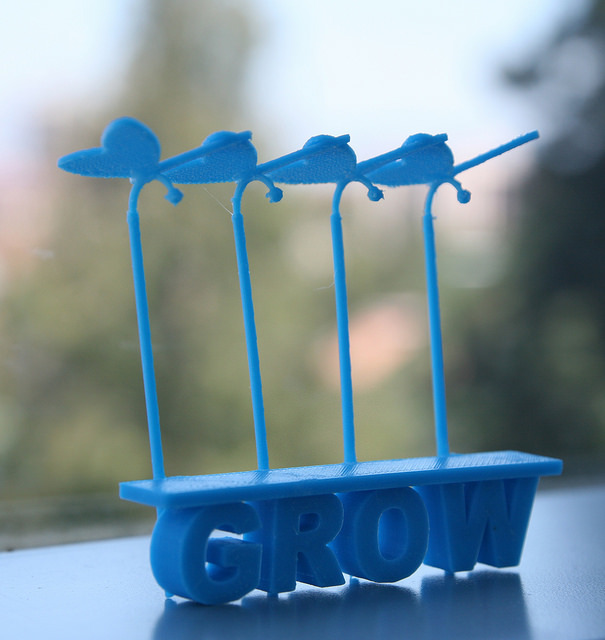 Teens have a chance to work together as a team to brainstorm ideas and create a quality product. They can also use the technological skills they learn to produce podcasts of their own! Where can you publish podcasts with no cost? Sukalaya Kenworthy is a Youth Services Supervisor at the Boca Raton Public Library. She holds an MLIS from the University of South Florida and an MA in Teaching English as a Second Language from the University of Central Missouri. When not leading book groups or teaching Maker, Robotics, and Coding classes at the library, Sukalaya watches Korean drama, attends church, reads juvenile and YA fiction, and tries her hand at new Thai recipes. Sukalaya was born and raised in Bangkok, Thailand. 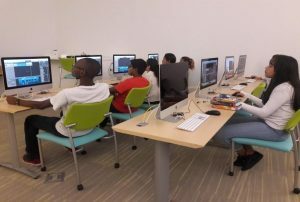 This year’s Teen Tech Week theme, “Libraries are for Creating,” highlights how teens can combine technology and creativity to create some truly unique products. The ideas and resources here make for great program activities this Teen Tech Week and any time of the year. 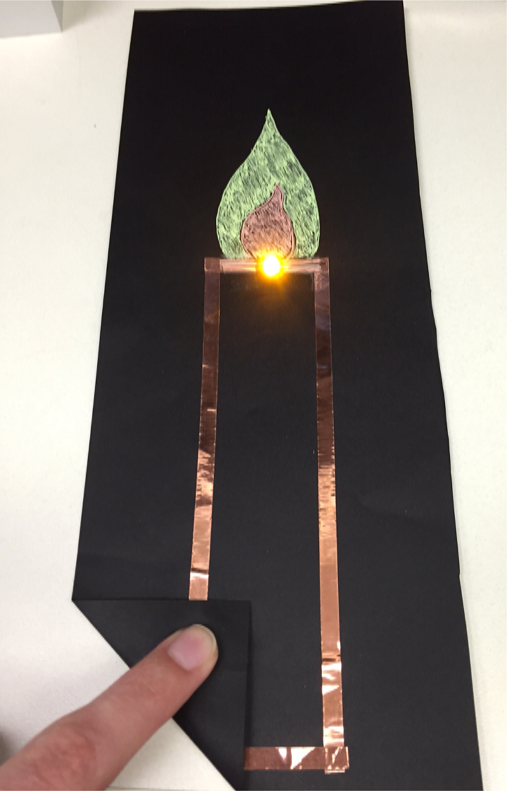 This low-tech, low-cost project integrates art into an activity that is perfect for teaching how circuits work. The main supplies are copper tape, a 3-volt coin cell battery, and a basic LED. MIT’s High-Low Tech features a tutorial and templates, and Sparkfun has a list of projects. If money is not a barrier, take it a step further with LED stickers from Chibitronics. Sewable circuits similar to paper circuits, only instead of copper wire, electrical current is conducted through conductive thread. Create a circuit with the thread, an LED, a battery holder, and metal snaps. The sewing is fairly basic, so sewing newbies should be able to participate, but teens without an existing understanding of circuits might do better starting with paper circuits. One draw of sewable circuits is that teens can create a functioning and (possibly) fashionable product in a relatively short amount of time. MIT has an excellent lesson plan here, or this Instructables project is a good starting point. Please contact the office of your Representative in the House and ask them to sign on to the “dear appropriator” letters for two critical pieces of library funding: the Library Services Technology Act (LSTA) and Innovative Approaches to Literacy (IAL). Please share this widely and encourage your colleagues, coworkers, friends and family to contact the offices of their Reps as well. This is an extremely tough budget year, and without huge grassroots support (i.e. thousands of voters contacting Congress), the nation’s libraries will lose this critical funding. The deadline to sign the letter is April 3. Go here to contact your Rep’s office: http://cqrcengage.com/ala/home –ready to use messages are waiting for you! Thank you for all that you do to support teens and libraries! 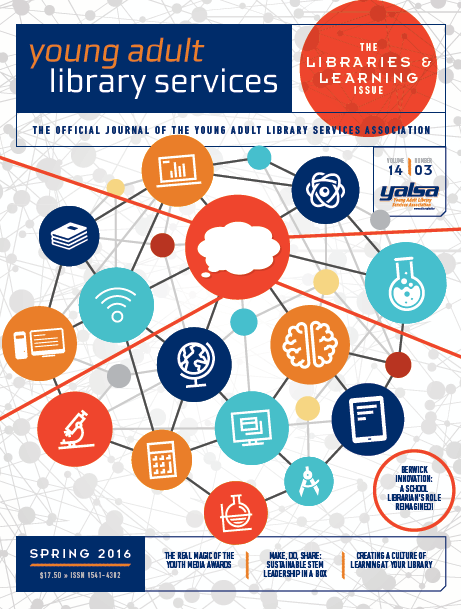 By Elise Martinez August 16, 2016 January 3, 2018 Learning Experiences, YALSA Info. You know how it goes: it’s 3 o’clock in the afternoon and suddenly the library has become overtaken by teens! This after school rush is prime time for library staff to engage teens on a variety of levels, whether that be through interest-driven activities or by encouraging them to learn a new skill; the opportunities are limitless. Passive programming is a great way to do this without throwing teens right back into the structured learning environment that they just left. Teens need a chance to unwind, however, exploration and discovery doesn’t need to stop! When I first took up my position as library staff working with teens, I was overwhelmed by the potential for programming that I felt should be happening after school hours. I tried to push everything into this limited time frame and as I was feeling burned out, I realized my teens were too. I turned to passive programming to change things up and offer a different variety of learning opportunities for teens after school. Use your space: At my library, Zion-Benton Public Library in the northern Chicago suburbs, we recently opened a teen space during the summer of 2015. This space has provided us with plenty of opportunities for cohesive, creative passive programming. During the first few months after the teen space’s debut, we asked teens to help us promote the new space by taking a creative selfie that answered the question, “how do you use the teen room?” We asked them to post it on social media and get the word about the opening. It was a lot of fun to see the different ways that teens enjoyed the space! Don’t have a dedicated teen room? Set out a monthly guessing jar for teens, or a weekly (or daily!) riddle out on your reference desk. You can still engage teens and provide some fun passive activities for your daily visitors. Get teens involved: I decided to use teens to promote various programs by encouraging them to take a selfie with a particular book or performing a specific activity. For example, every April we host an author festival for teens at our library. I will put the visiting author’s books out on a table a week before the festival with a sign encouraging teens to create word art that predicts what the books are about, based on the book’s cover. If they take a selfie with the book and their sign, post it on social media and tag the library, we give them some kind of small incentive. 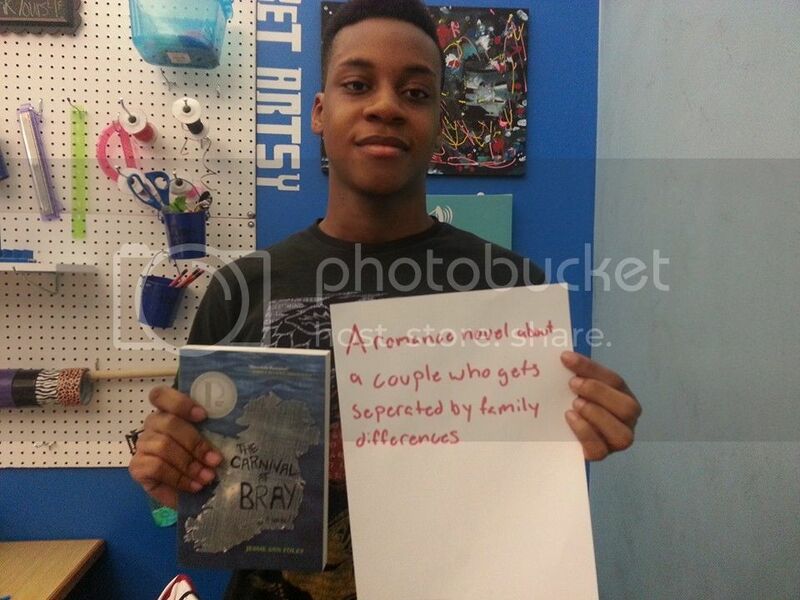 Teens come up with some pretty crazy ideas based on the book’s cover. We usually call this passive program, “Judge a Book by It’s Cover.” It’s always a hit. You could do the same kind of activity with teen book reviews as well. The report also shares the primary way teens access the internet with 91% of them using mobile devices at least occasionally. This means if a teen has a mobile phone with internet access they are adequately connected to the digital world, right? Martin counters this argument by throwing down more facts such as, “one-quarter of those earning below the median income and one-third of those living below poverty level accessed the Internet only through their mobile devices.” Resulting in a significant part of the population being under-connected according to the “Opportunity For All?” findings. What does this have to do with libraries, though? In the current trend of libraries increasingly adding “innovation” to mission statements and “technology skills” to job descriptions while working towards increasing access we may be missing the key element in creating digital equity, or equal access and opportunity. 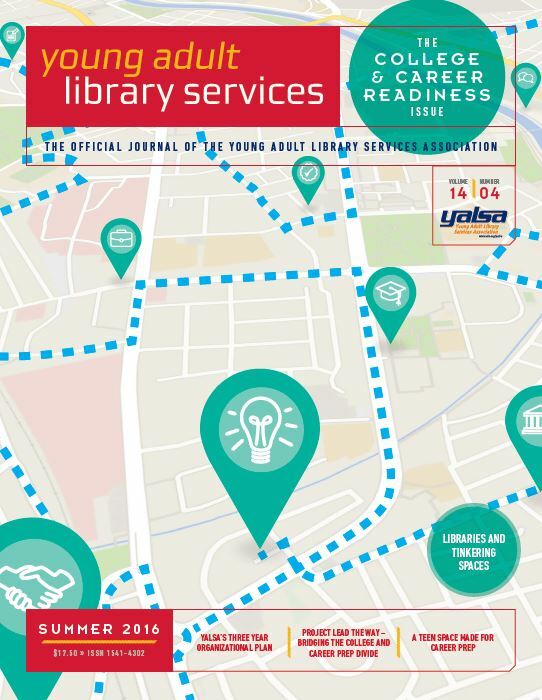 Giving teens school tablets or providing free library wifi is a great start, but what happens when that teen lives in a home without an internet connection or lives too far away from the library to attend on weekends? When used correctly technology can be a valuable tool in fostering digital participation, but our approach as educators is the most important action to take. Just over a month ago I became the first STEAM Librarian at the San José Public Library, located in the heart of Silicon Valley. While my title is new, STEAM programming is far from new to my urban library system. Surrounded by so many technology resources and partners, we are lucky to have passionate library staff leading STEAMstacks programs and participating in worldwide events like Hour of Code. Before my position was even created our Innovations Manager brainstormed ways to extend STEAM programming to the city’s underserved neighborhoods. 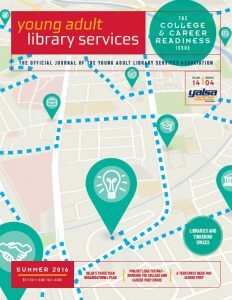 Part of the envisioned future stated in The Future of Library Services for and with Teens: A Call to Action is for library staff to “leave the physical school library or public library space regularly and provide services to targeted communities of teens (e.g. those who are incarcerated, homeless, in foster care, or in classrooms and other in school locations) where they are, rather than waiting for teens to find a way to get to the physical library space.” The Maker[Space]Ship, a mobile makerspace, is designed to do just that. The inclusion of school libraries in the ESEA (Elementary and Secondary Education Act) of 1965 authorization as ESSA (Every Student Succeeds Act) in late 2015 was a victory, especially for districts reliant on federal funding, but it is technology that is altering what is going on in so many schools. States switching to the computer-based standardized testing required by Common Core State Standards — independent of the CCSS backlash, major assessments are still and will likely remain CCSS aligned — will require supplying hardware accommodating increasingly resource-intensive testing with interactive charts and graphs and locked-down browsers. In many schools, the librarian will be the point-person for maintaining that technology. At the AASL conference in November, Michelle Luhtala shared a picture of charging blocks and cables. That’s what she “circulates” at 1:1 New Canaan High School, and it’s a brilliant idea for quantifying student use. Door count had potential as well to show the vibrant, active aspects of our school library spaces independent of checking out books.